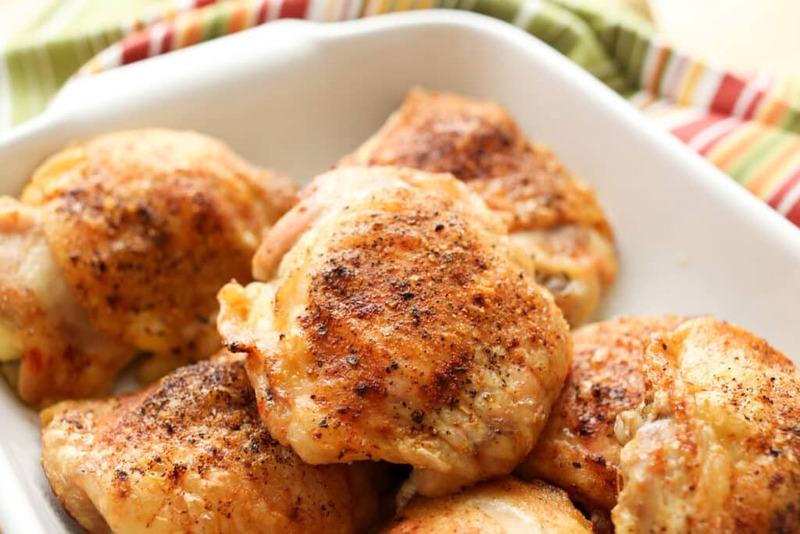 Crispy Baked Chicken with juicy meat and a crisp, flavorful skin can be on your dinner table with about 5 minutes worth of effort. This crispy chicken is made in the oven without any breading at all; the only ingredients you need are the chicken, a drizzle of oil, salt, and pepper. I am absolutely beside myself to have finally recreated our favorite chicken recipes, without the mess on the stove-top and with minimal cleanup. 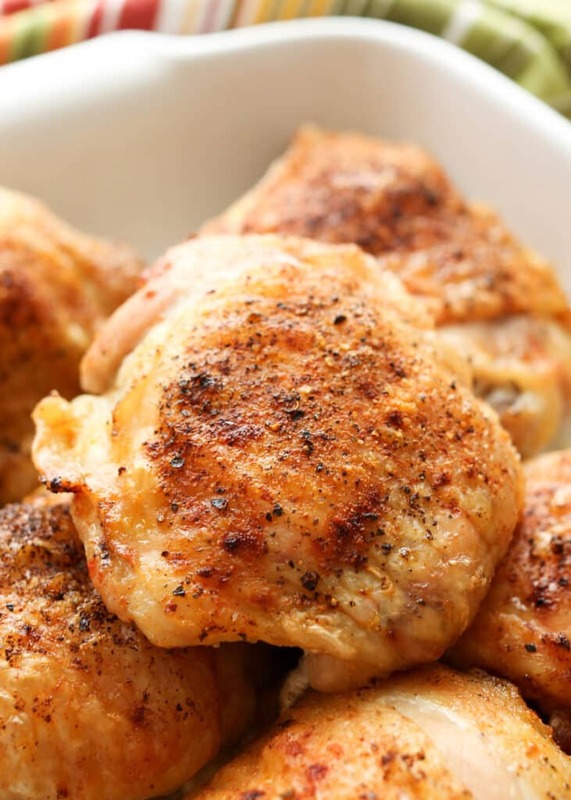 If you haven’t tried that very simple cooking method yet, you should, because you simply have to taste it to understand how amazing a single piece of chicken can be. Over the past few years, I’ve tried a few different methods to recreate that flavor and crispiness in the oven and I am giddy to have finally nailed it. I’m dubbing this the easiest dinner recipe ever because it requires no prep, no marinade, no special anything at all in advance. Grab your chicken, sprinkle with salt and pepper, then bake. Seriously. That’s all the effort it requires. You’ve literally just gifted yourself an hour to crash on the couch, read a book, watch a show, and in general ignore everything else; while the chicken sizzles in the oven and fills the house with delicious smells. This Oven Baked Crispy Chicken will fool everyone into thinking you are actively cooking dinner. It sounds too good to be true, but the chicken really is amazing without anything extra needed at all! Want a few more dinner ideas that require almost no effort at all? This Sheet Pan Chicken Dinner is an all in one meal that family and friends all rave about every time they make it. Southwest Chicken Salad with Spicy BBQ Ranch Dressing is a fantastic salad that is sure to satisfy the heartiest of appetites. Chinese Beef and Broccoli Soup by The Food Charlatan comes together in minutes and this Cheesy Ranch Chicken and Potatoes by Taste and Tell is a kid-favorite that requires little more than slicing the potatoes. These Stir Fry Noodles with Chicken and Vegetables happen in my kitchen on a regular basis. Once you’ve tried them, they’re going to be on regular rotation for you too. This Southwest Beef and Potato Skillet by Aggie’s Kitchen is on regular rotation in my house as well. I LOVE the easy weeknight dinners. Preheat the oven to 400 degrees. Line a large baking tray or half sheet pan with foil and place all the chicken pieces on it, skin side down. Sprinkle with salt and pepper and flip each piece skin side up. Drizzle about a teaspoon of oil over the skin on each piece of chicken and rub lightly to coat. Sprinkle again with salt and pepper. Bake for one hour, until most of the fat has rendered out of the chicken and the skin is golden brown and crisp. Remove from the oven and let rest about 5 minutes before serving. 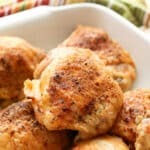 Juicy chicken thighs with a crisp and flavorful skin can be on your dinner table with about 5 minutes worth of effort. This crispy chicken is made in the oven without any breading at all! Preheat the oven to 400 degrees. Line a large baking tray or half sheet pan with foil and place all the chicken pieces on it, skin side down. Sprinkle with salt and pepper and flip each piece skin side up. Drizzle about a teaspoon of oil over the skin on each piece of chicken and rub lightly to coat. Sprinkle again with salt and pepper. Bake for one hour, until most of the fat has rendered out of the chicken and the skin is golden brown and crisp. Remove from the oven and let rest about 5 minutes before serving. Enjoy! I’ve been using your recipe since November and these are a huge hit with my family. I add onion powder, garlic powder, and Italian seasoning along with the salt and pepper and they turn out great! 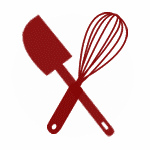 How would I adjust temp or cooking time with legs? For bone-in chicken, it should be about the same. Drumsticks might be a few minutes less, the whole leg (with drumstick attached to the thigh) might take a few more minutes. Chicken pieces vary greatly in size, so I typically just keep an eye on the oven when making this with different sized pieces. This recipe sounds fantastic but unfortunately only have bone-in chicken breasts in my refrigerator right now. Any suggestions on how to recreate something similar with breasts? Thanks! If you've had luck cooking meats in the toaster oven before, it should work fine. All ovens are different though, so I can't speak to how it will work in yours. Finally a method that works and produces tasty chicken! I'm thrilled that you like the chicken so much, Cindy! I myself love this. Chicken is very juicy and not at all oily. I do lift the skin and place some seasoning. However no one in my family likes dark meat. Do you have a suggestion of how to long to cook a couple of breasts? If they're bone-in skin-on chicken breasts, the time will be about the same. Watch for crispy golden skin and remove from the oven at that point. This can be made early in the day, Karen. However, the chicken won't be as crispy when reheated. You can reheat in a skillet on the stove (skin side down) or in the microwave. The chicken is cooked uncovered, Julie.